3rd Row Seat, Heated Leather Seats, Navigation, DVD Entertainment System, ADVANCED SAFETYTEC GROUP, TRANSMISSION: 9-SPEED 948TE AUTOMATIC... Bright White Clear Coat exterior, Touring L Plus trim. EPA 28 MPG Hwy/19 MPG City! AND MORE! KEY FEATURES INCLUDE Leather Seats, Third Row Seat, Navigation, DVD, Quad Bucket Seats, Rear Air, Heated Driver Seat, Heated Rear Seat, Premium Sound System, Satellite Radio, iPod/MP3 Input, Onboard Communications System, Remote Engine Start, Dual Zone A/C, Power Fourth Passenger Door. Rear Spoiler, MP3 Player, Keyless Entry, Privacy Glass. OPTION PACKAGES WHEELS: 20 X 7.5 ALUMINUM BLACK NOISE Falken Brand Tires, Tires: 245/50R20 BSW AS (TYK), Locking Lug Nuts, ADVANCED SAFETYTEC GROUP Lane Departure Warning Plus, ParkSense Front/Rear Park Assist w/Stop, Automatic High Beam Headlamp Control, Parallel & Perp Park Assist w/Stop, Rain Sensitive Windshield Wipers, Adaptive Cruise Control w/Stop & Go, Advanced Brake Assist, Full Speed Forward Collision Warning Plus, 360 Surround View Camera System, S APPEARANCE PACKAGE Body Color Door Handles, Bridgestone Brand Tires, Premium Fascia Upper/Lower Grille w/Black Surround, S Badge, Wheels: 18 x 7.5 Aluminum Black Noise, Black Spear Rear Fascia Applique, Black Chrysler Grille Wing Badge, Black Badging BUY FROM AN AWARD WINNING DEALER The staff at Mount Airy Chrysler Jeep Dodge is ready to help you purchase a new or used car in Mt Airy. When you visit our car dealership, expect the superior customer service that you deserve. With years of experience and training, our team will get you into the car, truck, or SUV that was built for you. Get the new or used car by Jeep, Dodge, Chrysler or RAM in Mt Airy that you have been dreaming of by calling or visiting our dealership today. Fuel economy calculations based on original manufacturer data for trim engine configuration. Please confirm the accuracy of the included equipment by calling us prior to purchase. Moonroof, Third Row Seat, DVD Entertainment System, Navigation, Heated Leather Seats, Rear Air, Power Liftgate, S APPEARANCE PACKAGE. Limited trim, Granite Crystal Met. Clear Coat exterior. EPA 28 MPG Hwy/19 MPG City! CLICK NOW! KEY FEATURES INCLUDE Leather Seats, Third Row Seat, Navigation, Quad Bucket Seats, Power Liftgate, Rear Air, Heated Driver Seat, Heated Rear Seat, Cooled Driver Seat, Back-Up Camera, Premium Sound System, Satellite Radio, iPod/MP3 Input, Onboard Communications System, Dual Moonroof Rear Spoiler, Privacy Glass, Remote Trunk Release, Keyless Entry, Child Safety Locks. OPTION PACKAGES UCONNECT THEATER W/STREAMING 3-Channel Video Remote Control, Seatback Video Screens, 220 Amp Alternator, High Definition Multimedia Interface, 115V Auxiliary Power Outlet, Video USB Port, 3-Channel Wireless Headphones, Blu-Ray/DVD Player/USB Port, S APPEARANCE PACKAGE Body Color Door Handles, Body Color Exterior Mirrors, Upper/Lower Grilles/Blk Surrounds Premium Fascia, S Badge, Black Spear Applique - Rear Fascia, Black Chrysler Grille Wing Badge, Black Badging, Black Day Light Opening Moldings, Black Stow N Place Roof Rack, ENGINE: 3.6L V6 24V VVT UPG I W/ESS (STD), TRANSMISSION: 9-SPEED 948TE FWD AUTOMATIC (STD). 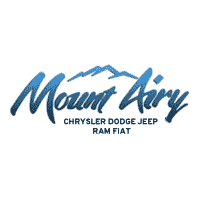 OUR OFFERINGS The staff at Mount Airy Chrysler Jeep Dodge is ready to help you purchase a new or used car in Mt Airy. When you visit our car dealership, expect the superior customer service that you deserve. With years of experience and training, our team will get you into the car, truck, or SUV that was built for you. Get the new or used car by Jeep, Dodge, Chrysler or RAM in Mt Airy that you have been dreaming of by calling or visiting our dealership today. Fuel economy calculations based on original manufacturer data for trim engine configuration. Please confirm the accuracy of the included equipment by calling us prior to purchase.